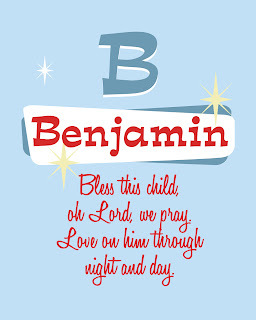 It, too can be personalized for that new granddaughter, son, niece, or second cousin's friend's daughter-in-law's little boy! I love the Antique and Old Age Art. It is sweet. I had a very hard time choosing so then I thought what about the set artist note cards and I could frame them and have a little of each. I love the new kids prints and my soon to be two girls will share a room so I might have to get two! All I can think of is my grandmother and her life. She inspired me to live life to the fullest with a smile on my face. Through all the tragedy in her life she is still remembered for her sweet spirit and lovely smile. Your art is inspiring. I love Sing to the Lord, Bloom, and Fruit of the Spirit. I love the Vine and branches one. It reminds me that apart from Christ, I am truly nothing. Nothing good can I accomplish in my own strength. Thank you for a beautiful display of that truth. The new personalized art is so cute! I love the Bloom Where You're Planted print in Blue... so very true! If you love something, set it free. If it comes back to you, it's yours, if it doesn't it never was. Thank you for your encouraging words on my post! 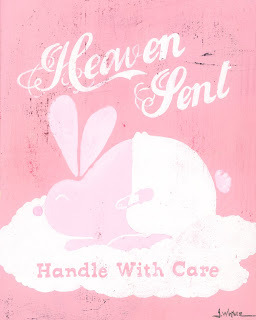 Love your Heaven Sent Handle With Care print. I have two precious little grandsons God has given me to enjoy this year. My thought for the day. "It really is worth it." This is just the type of artwork I've been looking for to decorate my baby's nursery (being induced this Friday with my sweet baby boy!). 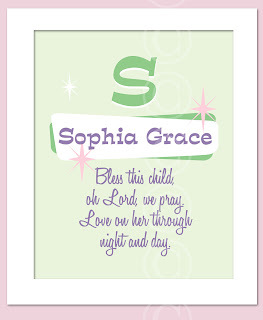 I love PERSONALIZED Heaven Sent Baby - blue. 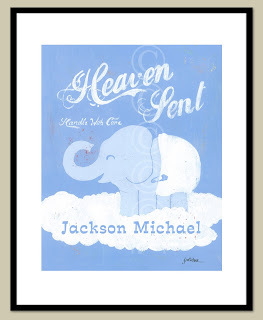 I love the Heaven sent Boy elephant version how cute. And I love you blog. Thanks for your beautiful posts. I love all of your art prints! I can't really choose a favorite, and I guess I don't have to unless I win. You can't fail unless you stop trying. That one has gotten me through some tough times for sure! All her stuff is so cute! Inspirational thought: Happiness resides not in posessions and not in gold; the feeling of happiness dwells in the soul. These are absolutely gorgeous. My daughter would love to have one! Another giveaway... you're too generous! I love these new prints. As with everything you do, they are quality, beautiful, and inspiring! Your prints are adorable! I love the Pears Fruit of the Spirit. Inspiring comment...um..hmmm...OK..."just do it" Kind of a Nike antiprocrastinating comment because that has been my problem lately. Boy, I love ALL of your items.. there is no way I could pick just one! I am thinking.. your etsy shop.. and my christmas shopping this year. 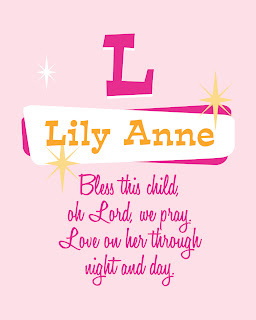 Jeanne - as always your new prints are just adorable! We fell in love with your work the first time we seen it! Congrats on all of your new items!! Now, we're off to look at all of the other goodies! Oh heavens so hard to choose! My Dad always told us to "Bloom where we were planted" so of course I love that one (in Turquoise) and I also love the Aqua "sing to the Lord". They are all lovely though! These are darling! I may have to get one for my new little nephew who is suppose to arrive in October. He is our little "miracle baby", after 12 years of infertility and two stillbirths. We are going to celebrate his coming! Thanks for visiting my blog, I love your site! I will stop by again soon. My favorite inspirational comment is Family is everything. Without them we are nothing. I love what you do!